“Aviation Stories-1: Dying to Fly,” is the first book in a series of aviation stories by Chriselda Barretto. While it is a fictional drama, it is based upon a true story. The protagonist, Ellen Sanders, is a senior flight attendant with over twenty years of experience. She develops concerns about her health when she starts experiencing extreme fatigue, along with tingling numbness in her joints. She expects relief after she has surgery for carpal tunnel syndrome, however, she notices a continued decline in her health after there is a serious incident at work. This incident involved being on a flight that had an odorous, smoky grey fog extending the length of the cabin. Sensors caused alarms to go off indicating that there might be a fire onboard, however, there was not. The plane returned to the airport, but it appears damage from inhaling the foul air triggered more health issues. In spite of her love for aviation, Ellen decides to change careers. She is thrilled to have her energy levels rise. When she runs into former co-workers, she discovers that several of them are experiencing health issues believed to be related to flying. This sickness is known as Aerotoxic Syndrome and it has been completely disabling for some individuals. Ellen meets with a doctor who is treating people for it and she decides to start speaking out about what she and others are experiencing. The author reports that Aerotoxic Syndrome not only affects aviation employees, but also people who fly frequently. It is critical that people know that this problem exists so that they can either insist that changes be made in the aviation industry or take care not to be overly exposed to these environmental conditions. After reading this book, I felt like aviation employees are the canaries in the coal mines for the aviation industry. This is an extremely scary thought! Personally, my biggest fears about flying have always centered around being exposed to germs from other passengers on the flight. Of course, I have had deeper fears about the plane crashing, but I know that I am more likely to pick up a bug from a fellow traveler. Learning about Aerotoxic Syndrome is an eye opener, especially for me because I already am dealing with autoimmune issues and have no desire to do anything to worsen my health. I enjoyed the way the author delivers this message in a dramatic suspense-like read, entertaining readers with a captivating story while educating the public. 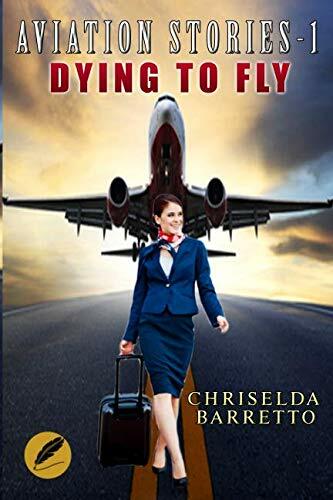 “Aviation Stories-1: Dying to Fly” by Chriselda Barretto is full of critical information and is a must-read for people who either work in the aviation industry or who fly frequently. Read the interview with the author!